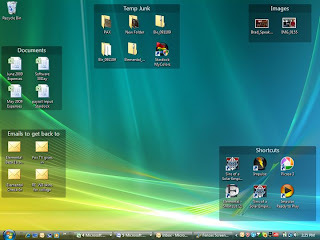 Now you can make your desktop more beautiful, more professional, more Stylish manner and Organize as you wish with Stardock product Fences. 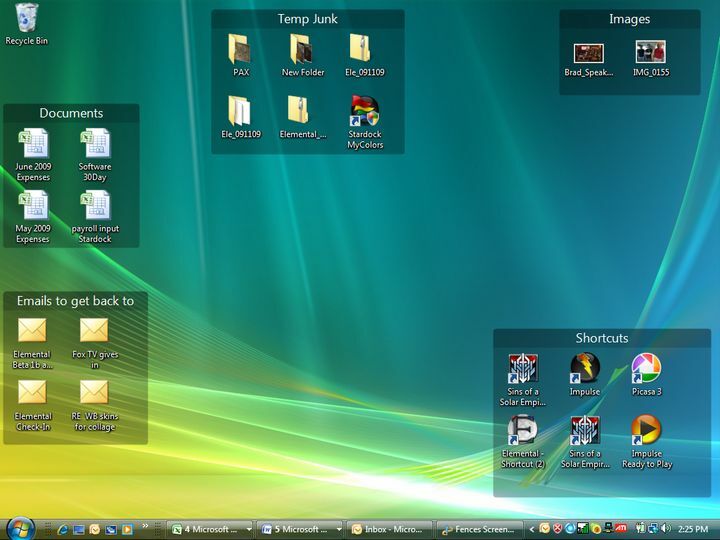 Fences® is a program that helps you organize your desktop, and can hide your icons when they're not in use. A "Fence", a term coined by this program, is an icon group on your desktop. Fences is an add-on to your desktop, not a replacement. Take and restore snapshots of your Fence layouts for backup, or for when you are doing different tasks. Change your resolultion for playing games and Fences will keep them in the same relative spots. In the Pro version of Fences, the "snapshot" feature has been enhanced to automatically take and keep recent snapshots on hand, ensuring your desktop layout never gets lost. Fences Pro allows you to set hide the repetitive desktop shortcut graphic from all of your icons. You can also hide the graphic just on shortcuts, executables or URL's to suit your needs. Fences Pro allows you to set a default Fence for all newly created icons. For example, you can create a Fence called "New Stuff" to catch all new icons, and then deal with them when you're ready. Order your icons the way that works best for you. Fences Pro adds ability to create rules, allowing you to send new files to fences based on their type, name, or a variety of other critieria. Rules can be applied either for new icons only, or can be kept applied at all times, keeping your desktop organized 24/7. Also added in Pro, you can now sort icons within a Fence. Sort your icons either by one of the standard methods (by name, type, date created), or by one of the unique options provided by Fences (date added to the fence, number of times opened). Fences allows you to tweak this sorting by optionally always bringing folders to the front, or to reverse the sorting order. Now that you've organized your icons, why have them sticking out like a sore thumb? To help keep your icons available but not quite "sticking out", with Fences Pro you can make individual fences appear subtly faded on the desktop, but ready for action as they fade up to full visibility when the fence is mouseovered.